We are looking for highly motivated research students with an interest in these exciting research areas Our only requirements are that the proposed research would be good, we have staff to supervise it, and that you would be good at doing it. We have up to 8 funded studentships, including industrial sponsored studentships, available for students interested in working towards a PhD. The studentships offers costs of fees and an annual tax-free maintenance stipend of about £13,726 per year for 3.5 years. Exceptionally well qualified and able students may be awarded an enhanced stipend of an additional £2,000 per year. Students should normally have or expect at least an upper-2nd class Honours degree or Masters degree in Computer Science or a related discipline. 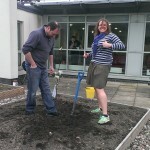 For further information on how to apply, see our postgraduate web pages (http://www.cs.st-andrews.ac.uk/prospective-pg). The closing date for applications is March 31st 2014 and we will make decisions on studentship allocation by May 31st 2014. (Applications after March 31st may be considered, at our discretion.) Informal enquiries can be directed to pg-admin-cs@st-andrews.ac.uk or to potential supervisors. Dr Adam Barker has been awarded a prestigious Royal Society Industry Fellowship. The scheme aims to enhance knowledge transfer in science and technology in the UK, and provides an outstanding opportunity to demonstrate the benefits of how industry and academia can work effectively together to drive innovation. Adam will be spending 50% of his time for two years on a collaborative project at Cloudsoft in TechCube, a world-class startup space in Edinburgh. Adam will be working on multi-cloud application management with Dr Alex Heneveld, Co-Founder and Chief Technology Officer (CTO) and his team. He will be contributing towards Brooklyn – an open-source, policy-driven control plane for distributed applications, and the OASIS Cloud Application Management for Platforms (CAMP) standard. The School of Computer Science has secured support from two major companies, Time Warner Cable and Adobe, and is able to offer two fully funded PhD studentships in exciting areas of research with important applications. Both studentships are fully funded for EU applicants (covering fees, and a stipend of at least £13.5K p/a) for up to 42 months, the expected duration of the PhD. Non EU applicants may apply but may be liable for an additional approximately £11K p/a in fees. Applicants should normally have (or expect to obtain this academic year) a 2:1 or (preferably) first class Honours Bachelors degree or equivalent in Computer Science, Computer Engineering, Software Engineering, Electrical Engineering, or a closely related topic, or a MSc (distinction preferred) in one of these subjects. PPSP in Computer Science – What’s been happening in the School of Computer Science? Posters, Prizes, Scholarships and Plants of course. 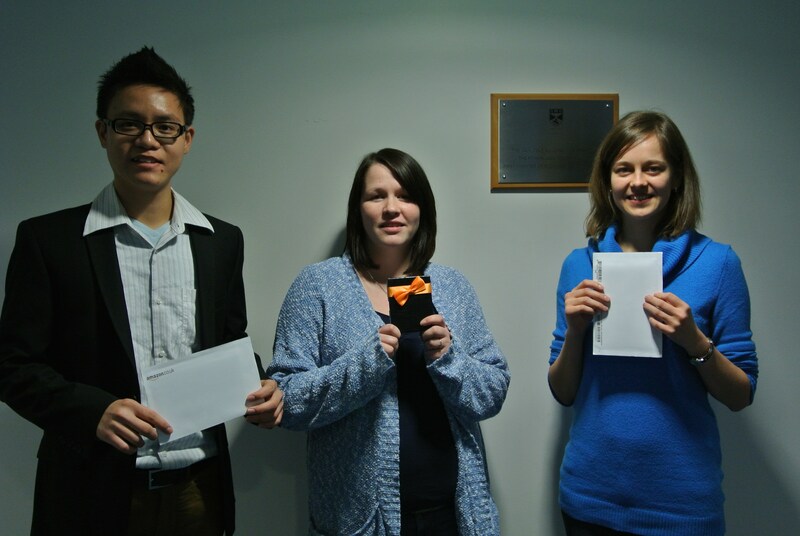 PhD students Anne-Marie, Ditchaphong and Ildiko are pictured shortly after receiving 1st, 2nd and 3rd place respectively in the annual poster session. 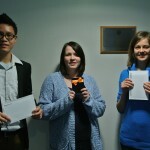 They received Amazon vouchers as a reward. Anne-Marie Mann – Turning a pen into a HAT (handwriting assisting technology) Investigating the effectiveness of a digital pen to improve handwriting skills. Supervisor Aaron Quigley. Ditchaphong Phoomikiattisak – An alternative Approach to IP Mobility. Supervisor Saleem Bhatti. Ildiko Pete – An Incremental Software Development Framework for Maintaining Artefact Consistency. Supervised by Dharini Balasubramaniam. Representatives from Adobe were in the school to award two new scholarships for Computer Science students at St Andrews. Applicants were asked to write an essay on the subject “What excites you about Computer Science?” Nathan Blades and Carson Leonard, both first year CS students, were this years recipients. 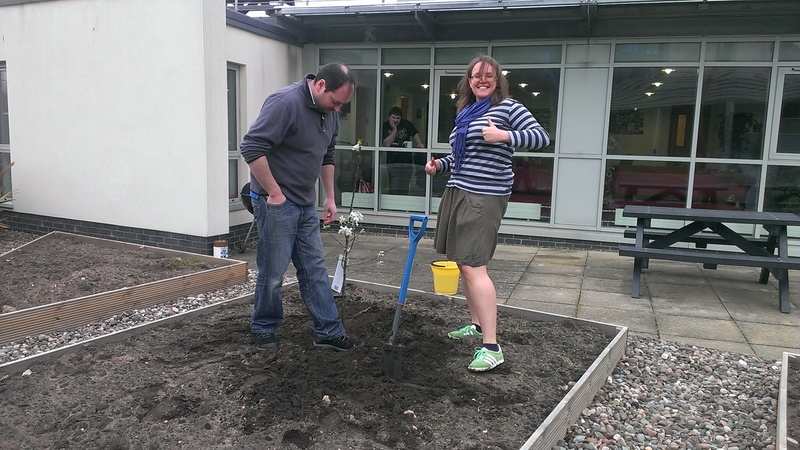 David and Ruth break new ground, planting an apple tree, in the Comp Sci garden. Security is currently two gnomes who should be approached with caution. We have had an outstanding pool of applicants for our 600th Anniversary Scholarships to do a PhD in Computer Science. This means that in the coming weeks we will be conducting many interviews with potential PhD students. If you are one of those, or if you are just interested in what our interviews are like, I thought it would be a good idea to tell you what our PhD interviews are like. I’m going to assume that “you” is somebody being interviewed for a PhD place, just to make writing the rest of this post easier. As part of Google’s ongoing commitment to furthering Anita’s vision, we are pleased to announce the 2013 Google Anita Borg Memorial Scholarship: Europe, the Middle East and Africa. Doctor Anita Borg (1949 – 2003) devoted her life to revolutionizing the way we think about technology and dismantling the barriers that keep minorities and women from entering the computing and technology fields. *Be a female student enrolled in a Bachelor’s, Master’s or PhD program in 2013/2014. *Be enrolled at a University in Europe, the Middle East or Africa. *Study Computer Science, Computer Engineering, Informatics, or a closely related technical field. *Maintain an excellent academic record. The scholarship recipients will each receive a 7,000 EUR scholarship. All recipients will be invited to visit a Google office in Europe for a networking retreat. Access to knowledge is our passion. When it comes to higher education for promising scholars, we do not want anything to stand in the way. That is why we are pleased to announce the 2013 Google Europe Scholarship for Students with Disabilities. *Be a student enrolled in a Bachelor’s, Master’s or PhD program in 2013/2014. *Be enrolled at a University in Europe or Israel. *Be a person with a disability. The scholarship recipients will each receive a 7,000 EUR scholarship. All scholarship recipients will be invited to visit a Google office in Europe for an all-expenses-paid networking retreat.